This reminds me of another book I am reading by a somewhat lesser known Mega-Pastor John Hagee, his book is called The Power of the Prophetic Blessing, I was saving my comments about the lies of Word-Faith pastors till I did my book review but since it seems to be heresy hurricane season I will go ahead and tell you what the Bible says that is contrary to this heresy…and I’d like all other pastors that are in cahoots with these W-F heretics to take notice, it doesn’t matter how many people are “getting saved” in these churches, false doctrine makes false converts. As a pastor you should be protecting your sheep from these men, not giving them a platform to spew their lies and half-truths. And though I am referring specifically to Mark Driscoll, who has the nerve to call Joel Osteen a brother in Christ from the pulpit/stage on a Sunday morning and participate in a Google hangout with Steven Furtick to promote his new book, there are other pastors out there that will promote these lies. This is more than a lack of discernment on Driscoll’s part, Osteen and Furtick are both preaching a message contrary to the true gospel, and contrary to the Bible as a whole. In fact the Word of Faith heresy is the exact opposite of the life we are called to as Christians. But godliness with contentment is great gain, for we brought nothing into the world, and we cannot take anything out of the world. But if we have food and clothing, with these we will be content. But those who desire to be rich fall into temptation, into a snare, into many senseless and harmful desires that plunge people into ruin and destruction. For the love of money is a root of all kinds of evils. It is through this craving that some have wandered away from the faith and pierced themselves with many pangs. But as for you, O man of God, flee these things. Pursue righteousness, godliness, faith, love, steadfastness, gentleness. The Bible actually says let him be accursed…avoid such people…I believe that any pastor who willingly gives platform to these heretics is in clear violation of scripture and have disqualified themselves of the position they hold, unless the own up to their mistakes and repent of endangering their flock. 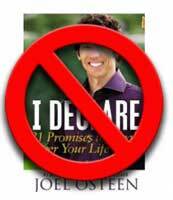 The prosperity gospel and Word-Faith movement are a damnable lie because Gods blessing is not measurable by a persons physical prosperity. Times of difficulty and trials in our life add depth to our relationship with God, because in those times either you are truly relying on Him and not to our own understanding or if you have fallen prey to the Prosperity Gospel and Word of Faith movement you are cursing God when trials come and showing you never really trusted Him in the first place…you just wanted more stuff. The original appears with a comments section right here.